This Party Fried Meat is so tasty, great for special treats and for your guests when you are having a party. You will need a police dog to guard this meat else, they will disappear in no time. Peel and dice the garlic, ginger and ¼ onion. Blend the three ingredients with a hand blender. Cut the beef into small rchunks and place them in a bowl. Add the thyme, black pepper, stock cubes and the garlic-thyme-onion blend. When done, cover and place in the fridge to marinate for at least 1 hour. Wash all the vegetables and remove the seeds from the green and red bell peppers. Cut the vegetables into medium squares and set these aside (see video). After about 1 hour, bring out the marinated beef and place in a pot. Spread it out in the pot, cover and leave to steam on medium heat. Keep an eye on it and stir often so it does not burn. After about 10 minutes, the beef will become pale with no blood in sight. Remove the beef from the pot. Pour some vegetable oil (2 inches deep) into another clean dry pot and set it on the stove to heat up. When hot, add a chunk on onion and then add some beef and start frying on high heat. Stir constantly and once the beef is golden all over, take them off the oil. Place them in a sieve lined with paper towels and leave to cool. 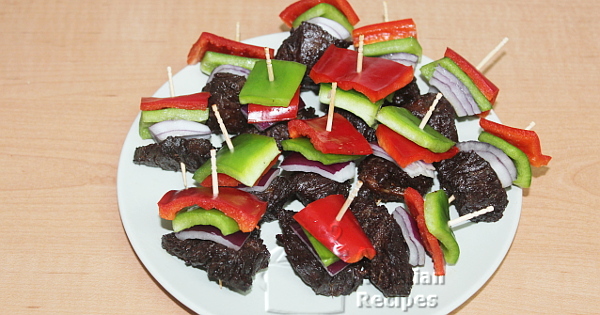 When cool, thread the fried beef and vegetables in the order: green pepper, red pepper, onion and one fried beef. You are done! Serve with a chilled drink, Nigerian rice dishes, salad, Moi Moi and many more. Watch the video below to see a demo.